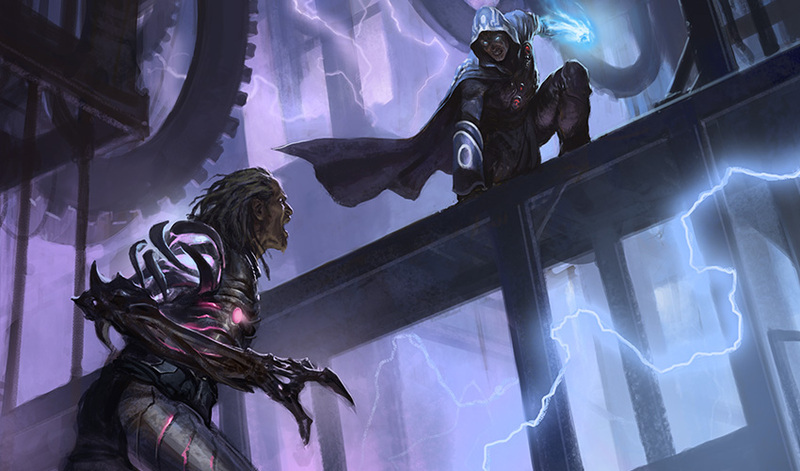 Previous Story: "In the Dead of Night"
Under the oppression of the Consulate crackdown, the Gatewatch are limited in their ability to discover what the dangerous artificer Tezzeret is plotting. With Tezzeret still maintaining control and leadership of the Consulate, the Gatewatch find themselves embroiled in the local conflict between rebelling renegade groups and the government forces. In between the skirmishes, Gideon Jura tries to determine the thin line between intervention and imposition. Gideon peered into his cup. The things that remained constant across the Multiverse never ceased to surprise him. Sure, here the kaapi was served hot and foamy, a flavor and texture distinct from the Ravnican coffee Jace seemed to guzzle with every meal back in his sanctum, but the bitter bite of the drink and the tingling jolt it gave a tired mind remained the same. Gideon looked up from his perch. The small café at which he sat offered a good vantage point of the dazzling square before him. Graceful architecture framed a bright blue sky painted with swirling clouds. An exquisite fountain anchored the ornate design of the plaza. Gideon imagined the square filled with people, as it surely must have been before the crackdown—a stark contrast to the few odd pedestrians that hurried across the open area now, their heads down and eyes locked on their paths. Yet even under the current political duress, the city of Ghirapur gleamed. 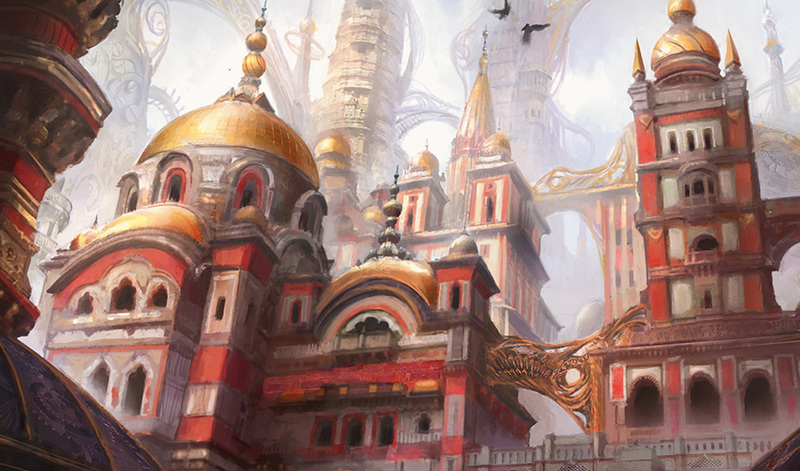 Weeks have passed since the Gatewatch came to Kaladesh. Weeks since their clash with Tezzeret, since the crackdown and the seizure of inventions. They've spent so much time in hiding, moving from safe house to safe house, aiding Pia and the renegades where they could, seeking out information on Tezzeret's plans. And still, Gideon was not sure they should be here. Gideon sipped his coffee. A good commander must maintain a clear head, even in the confusion and mayhem of an engagement. Temper the need of brash action with critical evaluation of the conflict at hand. How he valued this quiet moment, a lull between the fights of recent days. He took a deep breath. Boil it down to the basics. 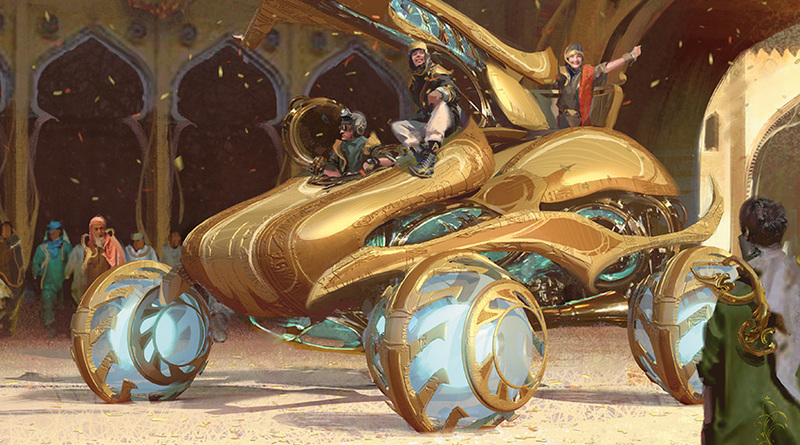 The Gatewatch is on Kaladesh to determine and neutralize the threat of Tezzeret. Gideon shook his head. Even this wasn't completely accurate. If he was honest with himself, they were here for Chandra. He was here for Chandra. His friend. Tezzeret had been an additional reason, a discovered threat. Yes, Tezzeret was now why the Gatewatch was here. But Chandra was the original reason why they all came—and Pia was the reason Chandra had stayed. They were why the Gatewatch now battled on the side of the renegade forces. The enemies of my enemies are my allies—but should the Gatewatch be taking sides in this local conflict? Should the Gatewatch be empowering local rebel forces, or should they have tried to work with Kaladeshi authorities, tried to work with Baan and the Consulate to illuminate the danger and threat of Tezzeret from within—a threat that Gideon still had no solid answers or definition for? Yet at the same time, how could he have possibly worked with Baan, knowing now what he did about what the Consulate did to Chandra's parents? How could he have abandoned Pia and betrayed Chandra's trust? Gideon thought back to his youth, wrongfully shackled by those who claimed to wield the law. He thought back to his time on Ravnica, wielding his hieromancy for Boros and fighting on the side of justice. He had seen this conflict several times before, of the force of law against those who refuted it. He had stood on both sides of this fight. He felt like he knew less now than ever about what to do. A small thopter flitted onto his table. He frowned, reaching a hand out. The thopter hovered into his outstretched palm, where its aether coils pulsed three times, long, short, long, before it flew off into the afternoon. Gideon sighed. Pia had news. Quiet moment over. Gideon finished the last of his coffee and stood, beginning his circuitous route back to Yahenni's penthouse. He found her on the roof. At first, he thought her hair was still aflame, but as he walked closer he realized the sun merely danced off the reds and oranges in a way that shimmered. She sat on the barrier at the edge, facing away from him, her feet dangling over. He came to a stop next to her and followed her gaze out over the city. Yahenni's penthouse was tall enough to offer them a spectacular view, and Gideon marveled briefly at how any being could accumulate such wealth in so short a life—just before the sight of Ghirapur stole away his thoughts. Sprawling streets and towering buildings stretched out before them, metals and chrome gleaming in the waning sunlight, aglow with aether blues that became more prominent as the shadows deepened. "Your home is beautiful." Gideon leaned against the barrier. "This was my home. Maybe still is. I'm not sure." She bit her lip, her eyes locked on the horizon. "You know, in all the mayhem, this is the first time I've really gotten to take a good look." Gideon's gaze swept from the horizon to the cobblestone street below. "It's beautiful, Chandra." Chandra scowled. "Currently ruined with all those stupid Consulate banners dangling from every window and building they could stick 'em on." She threw hands up. "How'd they get them made so fast, anyway? Makes no sense." "And why were you so quiet in that meeting back there? Just letting my mom talk and plan the renegades' next attacks, not once offering our help." Chandra turned and glared at Gideon. "Your silence was loud as hell, Gids. We're here to take down the Consulate and you—"
"No, we're not." Gideon hesitated, just for a moment. Hedge his words, or speak the truth? His eyes locked with Chandra. Her gaze burned away his doubts. Speak directly. Always. A flicker of flame flared through Chandra's hair, and Gideon felt a surge of heat. "Oh, you're only here because, what, I needed saving or something?" "We're here because we care about you, Chandra." Gideon smiled. Soft. Gentle. "We each took an oath to keep watch. That watch also means watching out for each other. We've got each other's backs." He frowned. "Even Liliana's. I think." Chandra laughed, genuine yet tinged with frustration. "Then why didn't you speak up while my mom was laying out their plans to overthrow the Consulate? If you have my back, you gotta have hers too. I want to help her. I need to help her. And I need your help to...help her." Chandra stamped in frustration. "You know what I mean. Right?" Gideon hoisted himself onto the barrier and sat next to Chandra. "Yeah. I do, Chandra. We want to help you. I want to help you. But the Gatewatch's focus must be Tezzeret. Not the Consulate." Chandra frowned. "But Tezzeret is the Consulate. At least, he is now." Her eyes narrowed. "And the Consulate deserves to burn." Gideon shook his head. "Don't let your personal vendetta cloud our purpose here, Chandra." Chandra turned on Gideon, anger sparking behind her eyes. "You say you have my back, Gids. But are you here as Gideon of the Gatewatch, or are you here as Gideon, my friend?" Gideon sighed. "I... I don't know. I had hoped they could be the same thing." The two stood quietly for some time. Finally, Gideon broke the silence. "I don't know the details of what happened between your parents and the Consulate. I don't know everything that happened here on Kaladesh. I do know, as your friend, I want nothing more than to shield you from that pain, to help you find justice." A small smile crossed Chandra face. Gideon smiled, then furrowed his brows. "...But that doesn't mean just lighting them all on fire." Chandra rolled her eyes. "All you do is try to tell me what not to light on fire." "Untrue. Sometimes I tell you what to light on fire." A chuckle escaped Chandra despite herself. "You and your stupid rules." Gideon shook his head. "I know all these may seem like unimportant details, but they matter." Gideon gestured out over the city. "We can't just go from plane to plane, meddling with each world's affairs, imposing our judgment and will. Otherwise, the line separating us from tyrannical mages would grow dangerously thin." Chandra gave Gideon a quizzical look. "Are you quoting my oath back at me?" Gideon shrugged. "Maybe you're having an influence on me." Chandra laughed, a laugh that broke into a snort. "For a law-bound indestructible soldier, you sure think a lot." "For a human fireball, you sure are compassionate and kind. We're all more than our powers, Chandra." Chandra looked down at her hands, little sparks and embers dancing along her fingertips. Gideon held up his own hands, his left tracing over the sural strapped to his right wrist. "I've learned the importance of knowing and setting limits. Otherwise you, and those you love, will bear the burden of your hubris." Questions lingered behind Chandra's eyes. Gideon took a deep breath and tried to speak, to share the story he has told no one—but his past remained a weight, heavy and unmovable, in the pit of his stomach. The two sat, the silence stretching taut while the sun slid behind the horizon. As the last rays of light disappeared, he felt her hand fall on his shoulder. He smiled at her borrowing his familiar gesture. "I trust you, Gideon Jura." Chandra gave Gideon's shoulder a comforting squeeze. "And, as much as I hate it, I'll try to focus on stopping Tezzeret....for now. Maybe. No promises." Chandra stood from her perch on the barrier, jumping back onto the roof. "But I'm also still going to help my mom and the renegades. Not as a member of the Gatewatch, but as Pia Nalaar's daughter." Gideon stood as well. "As you should. Spend time with your mom. Beyond all of this...you deserve the time to catch up with her. Plus, knowing the renegade's plans will only help us when we move against Tezzeret." Gideon started walking toward the stairs back down off the roof. "We should confer with the rest of the Gatewatch, and perhaps Ajani, on how we can learn and stop whatever Tezzeret is planning." Chandra watched him go for a moment. "Hey Gids." Gideon turned around. "I care about you too." Chandra caught up to Gideon, slugged him in the arm, then brushed passed him, bounding down the stairs two at a time. Gideon, for his part, tried to ignore the tightening in his chest as he followed her back down. "We need to talk." Gideon slammed the door shut, fuming. Liliana rolled her eyes as she sauntered across the room. "No, the large cat-man doesn't kill." Liliana threw open the wardrobe Yahenni had set aside for the Gatewatch and began rifling through it. "Not anymore," she said, doing an eerily accurate imitation of the Planeswalker. She rolled her eyes. "So righteous. Much mystery." "Neither do we." Gideon walked forward and closed the wardrobe door, forcing Liliana to look at him. Liliana laughed. "Um. I'm sorry. I seem to recall watching you cut down foes like weeds in Thraben." "Those were Eldrazi monstrosities. These are people." "We only kill ugly things, then? Because the short one, he would've still qualified." Liliana reopened the wardrobe and resumed her search. Gideon sputtered in disbelief. "We do not kill unless we must! And that just now—"
"That just now was a situation where 'we must.' Those Consulate forces saw us. Identified us. Attacked us. You think if we, what, knocked them unconscious, they would awaken and just magically forget they saw us walking out of this penthouse?" Liliana pulled out a large white kurta, gave it a quick appraising glance, and threw it over her shoulder. "Wiping memories isn't my specialty, and you've got our resident mind wiper running around on those stupid little recon missions. I only did what I'm best at." She turned, giving him a demure smile. "Death is just a tool in our toolbox. I'm just particularly good with that tool." "Death is a tool we should avoid using at all costs. That may be hard to grasp as a death mage." Gideon realized he was clenching and unclenching his hands into fists. He took a deep breath. "Oh, please. Do you know how many people I've not killed since arriving here?" Liliana threw the kurta at Gideon. "Plus, maybe if you put on a local shirt and blended in more, we wouldn't have been spotted." Gideon caught the shirt and glared at Liliana. Deep breaths. He quietly folded the shirt. She's trying to provoke you. He put the shirt down on a nearby chaise. "You do not need to assign the blame of their deaths to me. I take responsibility for the lives I end." Liliana rolled her eyes. Gideon kept his gaze on her. "I want to trust you, Liliana. I find that difficult when you betray the basic tenets of what we do." "We don't even know what it is we do." Liliana's face shifted from sarcastic mirth to deadly seriousness in a flash. "We're wasting our time playing Consulate and renegades when we should be eliminating Tezzeret." "You're right." Gideon took a little satisfaction as Liliana stepped back, eyeing him closely. 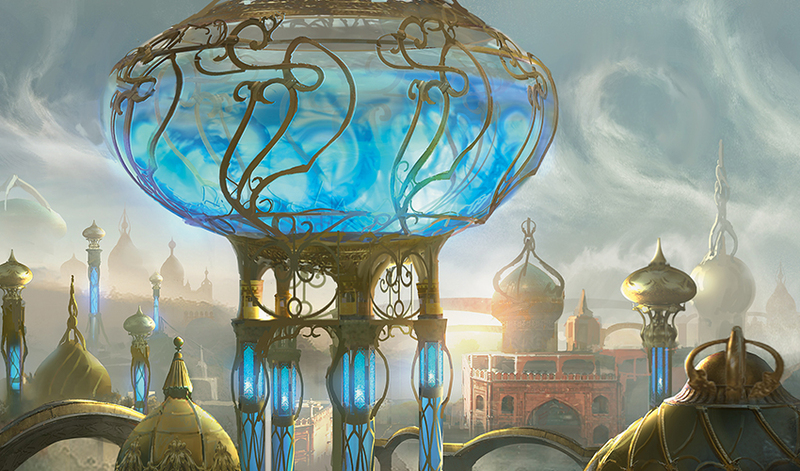 "That's why we have Jace shadowing Consulate forces to uncover more of Tezzeret's plans. 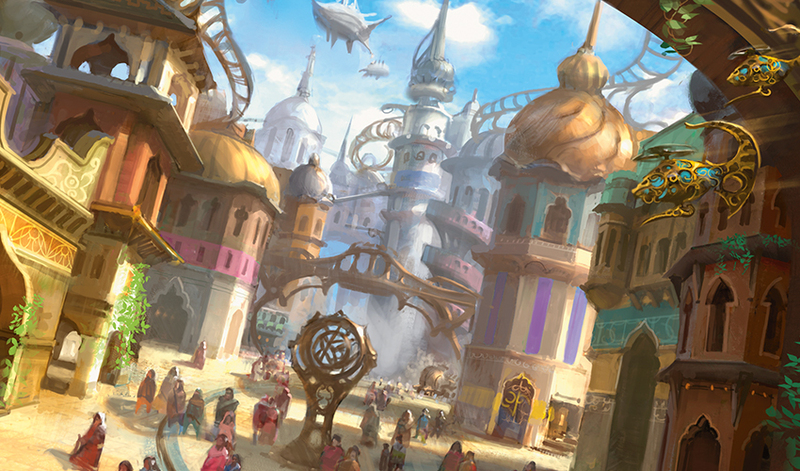 That's why Nissa and Yahenni are tracking the flow of aether in the city to try to find any potential locations where Tezzeret may be basing his operations. It's hard to stop a man if you don't know where he's hiding." Liliana scoffed. "What about Chandra escorting her mother to rally the renegades? Cat-man guarding the grandmother to do the same? Are those a part of the orders of the Gatewatch as well?" "It doesn't hurt to have renegade allies at the ready if it comes to a conflict." Gideon's voice lacked the conviction of his words. "Ah, of course. So we're just waiting for an army for you to command. Into a magically non-lethal combat. Against forces that are sending folks to capture or murder us." Liliana slinked close to Gideon, looking up into his face. "I can promise you Tezzeret won't have the same rules as you, Gideon. And if we don't stop him, he will kill far more people than I." She spoke barely above a whisper, her words a soft hiss lingering in the air. "After all, there's just one I want to kill on this plane. And he so, so has it coming to him." With that, she turned and walked toward the stairs. Gideon's words stopped her, and Liliana turned back, an eyebrow arched into a question. "The way you speak. He must have done something to you. Taken something personal from you." Gideon returned her gaze, his face a mask of calm conviction. "He was the leader of an interplanar criminal organization that smuggled dangerous goods across worlds. His cruelty and madness is only outstripped by his propensity to manipulate and murder friends and foes alike. He's burned villages just to make a point." Gideon shook his head. "That's why you think I would want to stop him. Why do you want to stop him? To kill him?" For a moment, Liliana looked genuinely speechless. Gideon watched her closely. He saw a flicker of something within her eyes, a decision made behind those pools of violet. "He hurt something important to me. Destroyed something that was mine." The words were flat, but beneath her tone, Gideon heard the barbs of anger and hatred. "Keep out of my way, and I will end him and this whole charade." Liliana turned and glided up the stairs, her heels ringing out in sharp staccato as she ascended. Gideon sighed and ran a hand over his face. He was certain that wasn't the whole truth. But he was also certain that was the most truth than he had gotten out of Liliana yet. The Consulate charger barreled toward him, the scream of metal wheels against stone streets tearing at his ears. Gideon angled his left shoulder toward the vehicle racing directly at him and raised his arms in a guarded stance, his feet squared and braced for impact. His skin shimmered, waves of golden light cascading across his body. This charger was not so different from an enraged hydra rampaging through a town back on Theros—only instead of feral, bestial eyes, he saw, in the fleeting instant before impact, the terrified pupils of the driver. The charger smashed into Gideon. His feet scraped backward with the force, digging into the ground and sending shards of broken cobblestone flying. The charger tore itself to pieces, fragments breaking around him, gears and jagged metal slashing across his magically impervious body, golden rays of light sparking as those pieces collided against him. Even amidst the chaos of the exploding vehicle, Gideon's eyes remained fixed on that of the driver, and as the hapless man flew forward, his vehicle shattering to pieces around him, Gideon reached out and enveloped the man in his arms, turning as he did so to absorb the forward force of the pilot and shield him from the flying shrapnel. A blink of an eye. One moment, a formidable Consulate charger raced down the street. The next, a heap of scrap laid spread out before Gideon and the very dazed-looking pilot still cocooned in his arms. "You can probably call it a day." Gideon set the pilot down and clapped a friendly hand his shoulder. If the pilot had a response, it was lost as a massive metallic fist slammed into Gideon, sending him flying and crashing through the wall of a nearby building. The pilot looked up, eyes catching the blank stare of a steely gray automaton, towering above him at twelve feet in height, decked out in the reds and golds of the Consulate. The pilot paused for just a moment, then fled as fast as he could in the opposite direction while the steely gray automaton stomped toward the vaguely Gideon-shaped hole in the wall. Its march was cut short as another automaton, uncannily similar in its design but built from golden metals, ran and slammed into it head-first. The Consulate construct regained its balance and the two began to brawl, just as a small female figure clad in blue and burgundy dashed towards the hole. "Gideon! Are you okay? I'm so sorry—I didn't see the second Consulate construct!" Gideon emerged from the rubble, shaking his head and brushing dust from his shoulders. "I'm fine, Saheeli—though I'm mildly concerned that you missed seeing that." Gideon gestured toward the battling behemoths just the Consulate automaton landed a clean hit, knocking the golden one backward to crash through another wall. Saheeli shrugged. "They're surprisingly stealthy for their size." She raised her hands and Gideon felt a surge of mana as she gestured toward the broken scrap from the Consulate charger. Gideon watched with admiration as the gears and pieces reassembled themselves into two perfect smaller replicas of the larger battling automatons. 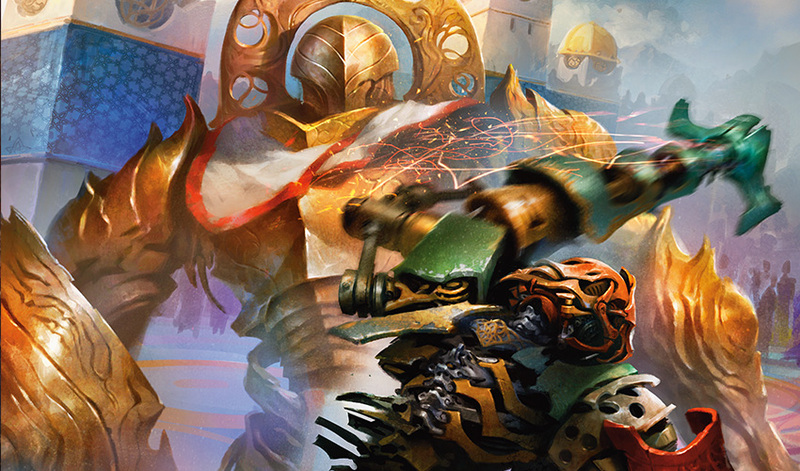 At another wave of Saheeli's hands, the two smaller constructs launched themselves into the fray, clambering over the Consulate automaton, severing aether cables and prying at its armor plating, even as the larger golden automaton pressed its relentless assault. Saheeli made a thrusting gesture and the golden automaton mirrored it, punching through the Consulate machine's chest and ripping out a tangled mass of tubes and glass, sending liquid aether splashing all over. The Consulate automaton stumbled to its knees, then fell with a deafening clatter to the ground. Saheeli pumped a fist in triumph. "That's Consulate design for you. Sturdy, but predictable. Always housing the power core in the same place on all their units." Gideon started to speak, but the sound of approaching footsteps had them both turn to face the incoming threat, his sural unfurled and her filigree metal spinning into shape. A massive cloaked figure leapt from a nearby rooftop and landed before them, almost soundlessly. Gideon and Saheeli took a reflexive step back, then Gideon breathed a sigh of relief as he recognized the blue eye peering at them from beneath the hood. "Ajani. What are you doing here?" Ajani stood to his full height. "We heard the commotion." "We all heard the commotion." Gideon turned and saw Liliana stride out from behind a nearby building, followed by Jace. From another roadway, Nissa and Yahenni rounded the corner, even as Chandra and Pia came running down a side alley. "Dang Gids, it looks like I was here." Chandra surveyed the still smoldering scraps and remnants littering the streets, as well as the multiple holes in various walls and buildings. "You guys smashed things up good." She waved at some unseen person through the wall Gideon had smashed into moments ago. A meek "hello" floated back. Gideon coughed, trying to recapture the group's attention. "Thanks for coming to assist, everyone, but if you all heard the noise, then no doubt Consulate reinforcements are on their way too. We should regroup with Saheeli at a new safe house and—"
"There's no more time." Saheeli strode forward to the center of the gathered group. "As I was telling Gideon, or trying to tell him before all this happened, I've found where Tezzeret is hiding." Mild pandemonium broke out as the news hit the gathered folk. Gideon held up his hands, then looked back to her. Saheeli continued. "He has locked himself away in a private workshop, hidden in the central Aether Spire. That's where he's keeping the winning inventor of the Fair and where he's working on something to do with her creation." "This fits what we've learned." Nissa stepped forward, nodding. Yahenni also spoke up. "Miss Nissa and I have recently determined an unusual flux of aether being diverted to that particular reservoir from the Aether Hub. "Then we storm the Spire and take Tezzeret down!" Chandra seemed ready to charge off already, but Saheeli was shaking her head. "The lab is sure to be heavily guarded. He also has the winning inventor in his grasp. She is—that is, Rashmi's my friend." Saheeli's voice caught, ever so slightly. "We need to get in, rescue her, and get out. I can't do it alone, but perhaps with one or two others..."
"If it's infiltration, Jace should go." Gideon nodded to his friend. "He would also be best equipped to determine what Tezzeret is trying to—"
"I'll go." Liliana stepped forward, pushing past Jace to stand between him and Gideon. "If Tezzeret is there, I'm there." Saheeli looked from Jace to Liliana to Gideon. Jace looked surprised, but Gideon caught his shoulders subtly drop, a release of tension and nerves. Gideon stared hard at Liliana. Liliana's blank expression revealed nothing. The seconds ticked by, each moment of indecision a growing weight on Gideon's shoulder. I want to trust you. Can I trust you? Saheeli's voice interrupted his thoughts. "We need to decide. Now." Saheeli nodded, satisfied, and started down the path toward Weldfast. Liliana followed closely. "Liliana," Gideon called after her. "Do what is right." Gideon watched a million unspoken responses flit behind Liliana's calm demeanor. One surfaced and carried across the square back to him. "I'll do what must be done." Gideon watched the two disappear down a side alley. A low growl from Ajani pulled his attention back to the assembled. "We should support them where we can." Gideon nodded to the leonin. "Ajani's right. If we cause a diversion, maybe we can pull some of Tezzeret's forces onto us." "I think we could do one better." Pia smiled, a grin that grew as she continued talking. "If this is as important as Saheeli says, other targets may be soft to a strike right now. Maybe we don't strike just for a diversion, but strike to capture something we need." "I take it you have a target in mind?" "We take the Aether Hub." Pia's eyes gleamed with excitement. "If we succeed, we could cut off power to the Spire and also to whatever Tezzeret is working on. We would also bring aether to the renegade inventors, to the people. It's a symbolic and material victory." "That sounds good—but if we succeed, there's no doubt Tezzeret and Baan would bring out their biggest weapons to stop us. I've fought battles where we expend our resources capturing that we cannot hold. I don't want to see that happen here." "Oh, the Consulate isn't the only one with powerful inventions on their side." Pia's smile was wide as ever, with a healthy dash of conspiracy. "We've been working on something big. All that's missing is the aether to power it and complete it." "Pardon." Ajani's rough cadence broke into the conversation. "There are sounds a few streets over. They are likely to be Consulate forces—in great numbers." "Let's move then. Mrs. Nalaar and Chandra, mobilize the renegades. Nissa, Jace, and Ajani, with me. We're going to run disruption until the renegades are ready to begin the assault. Hit, run, then disappear. Then when the renegades are ready, with Jace's telepathy and Pia's thopters, we'll coordinate the attack on the Aether Hub." Pia turned to go as the rest of the Planeswalkers moved toward Gideon. Chandra, however, stood still, her arms crossed. "Really, Gids? You're gonna go battle the Consulate and I don't get to come?" Gideon shook his head. "We're supporting Liliana and Saheeli's mission to thwart Tezzeret by creating a distraction." Chandra rolled her eyes in a manner distinctly like Liliana. "Call it what you want. Sounds like blasting some deserving jerks to me." In the distance, the sound of metal gears clanking and the stomp of boots stalked closer. Gideon ignored it, and kept his eyes on Chandra. "We'll need your firepower in the actual attack on the Aether Hub. In the meantime, I'm sure the renegades—and your mom—need your inspiration and presence more." Chandra snuck a look at Pia, who smiled and nodded. She looked back to Gideon, mild panic in her eyes. "Gids. No. No no no. You know I'm bad at the inspiring people thing. With the speeches and the talking." "You'll be brilliant. Just speak from your heart. Or don't speak at all." Gideon smiled, broad, open, honest. "Lead by example. Lead by your strength." Chandra's eyebrows scrunched, a storm of concern, but she shrugged and gave a terse nod, then turned and left with Pia. The sound of approaching Consulate forces was obvious now, and Gideon let his sural hang loose and ready. He watched Ajani spring into a hiding place on the rooftop and noticed Nissa ready her staff, vines already growing and protruding from between the gaps in the cobblestone, while Jace...well, just kind of stood there. And then a shimmer, so fleeting he wasn't sure he saw it. Huh. Mind magic: Gideon would never get quite used to it. "They're there! Stop them!" The shout of a Consulate enforcer broke across the square. Gideon readied his weapon, the telltale glow of light already spreading across his body.